Isolation is important if you need to separate two circuits completely, leaving no possibility of an electrical problem in one causing an problem in the other. The most challenging digital circuits to isolate are bidirectional data lines like the I2C bus. 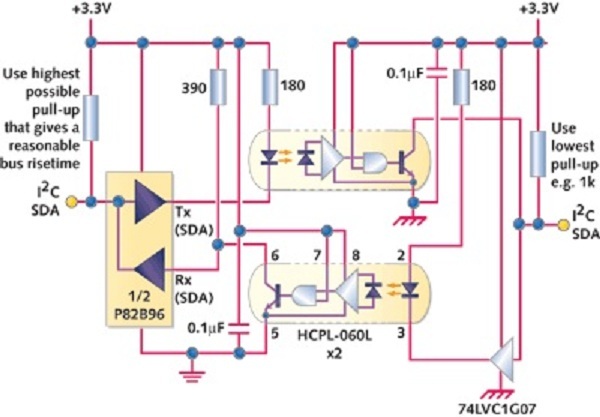 In this EETimes editorial the opto-isolation of the I2C bus is covered in detail. The I2C-bus is fabulously popular and successful as a low-cost way to attach chips together in small embedded systems. In some systems, though, these chips need to be opto-isolated to avoid damage from stray electrical current in harsh environments. This hands-on article shows how to isolate I2C devices without giving up the advantages of this popular bus. This entry was posted on Sunday, January 15th, 2012 at 11:00 am	and is filed under app notes. You can follow any responses to this entry through the RSS 2.0 feed. You can skip to the end and leave a response. Pinging is currently not allowed. I2C isolation used to be a real pain. Now there are parts to do it: Analog Devices Inc. (ADI) have their iCoupler line of I2C isolators. If memory serves the iCouplers are galvanic, not optical. Then again, like Maxim, ADI parts are often hard to get a hold of and pricey when you can. NXP has their P82B96 and PCA9600 bi-directional I2C opto-isolated buffers. I’m sure there are more out there. It seems that a cheap alternative with much less hassle is the analog device series ADuM125x/ADuM225x. One IC, no external parts.